5 Bedroom Detached House For Sale in Crowborough for Guide Price £1,150,000. 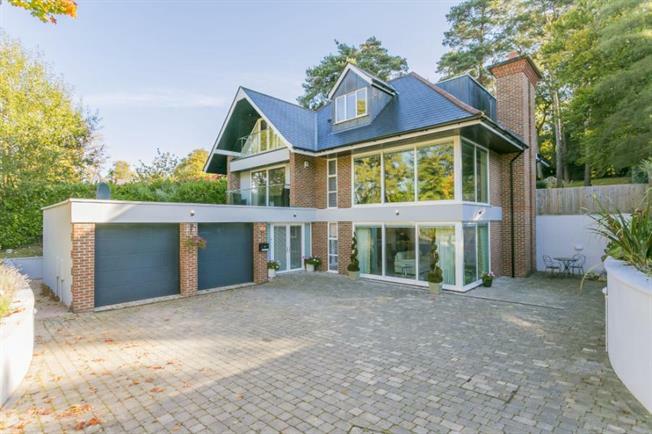 An outstanding contemporary detached property of exceptional quality incorporating smart design features and a stylish finish, five double bedrooms and five bathrooms, occupying a secluded position within the favoured 'Warren Area' of Crowborough. The property was built in 2012 and has been extensively upgraded by the current owner to provide substantial accommodation and a number of 'smart' and stylish features. The accommodation is light and spacious, benefitting from floor to ceiling windows throughout, and includes a welcoming entrance hall with solid oak flooring and staircase and integrated double coat cupboard, study, two cloakrooms/W.Cs and a double aspect sitting room with feature fireplace and full height windows and sliding doors to the terrace. The hub of the house is a beautiful open-plan kitchen with modern integrated appliances, reading area with roof lantern, wood-burning stove, dining area and a sofa area with double height floor-to-ceiling sliding doors. There is a separate laundry room and a utility room with door to the garden. The property provides five double bedrooms and five modern en suite bath and shower rooms. Two bedrooms benefit from glass balustrade balconies, two have glass Juliette balconies and one has glass sliding doors to the terrace. The property is approached via a block paved driveway, with mature planting to the front and LED lighting leading to the generous parking area adjacent to the attached double garage with electric up & over doors. The principal garden, which lies to the rear of the house, has an excellent degree of seclusion, surrounded in part by hedging and fencing. A wide paved terrace stretches the width of the rear of the house, adjacent to which is a level area of lawn. From the lawn a grassy bank rises to an area interspersed with mature trees including pine, oak and beech. In total just over 1/3 acre. The property is situated in a much sought after quiet road in the Warren area of Crowborough, and is approximately one mile from the town centre with its range of shopping facilities, supermarkets, banks and post office. Crowborough railway station is approximately 2.5 miles distant, located at nearby Jarvis Brook and providing direct rail services to London Bridge/Victoria. In addition, Crowborough and the surrounding area offers an excellent selection of private and state schooling for all age groups, Goldsmith Leisure Centre, an excellent golf course, horse riding and walking on the Ashdown Forest. The inland spa town of Royal Tunbridge Wells is approximately 8 miles away and offers more extensive shopping, schooling and mainline rail services to London (Charing Cross/London Bridge/Cannon Street). Gatwick Airport is about 23 miles.